You may think that an office cubicle is just a simple purchase—find one that’s inexpensive and sturdy, buy it, and set it up in your office for use. Especially if you’re on a budget, the idea of “cheaper is better” might tempt you into this type of purchase, giving you the illusion that you’re getting a good deal. The undeniable reality is that there’s a wide range of choices and features to consider when seeking the right workstation, and without giving them your due attention you can be left with an office cubicle that’s all wrong for your office. Storage space that’s sparse or wasted, floor space that’s cramped or sprawling, walls that are too confining or that invite too many distractions… all these are problems that can affect the productivity and comfort of employees. Since certain physical characteristics in your office cubicle can make all the difference in how you work, allowing your workstation’s function to determine form can avoid a lot of these problems while getting the most out of your money. As you prepare to outfit your space with office cubicles, along with any other large equipment and furniture, the wisest first step is to invest in quality office space planning services. How frustrating would it be to have invested the money and time into purchasing cubicles, ones customized to align perfectly with the needs of your company, only to find that your newly-furnished office space is simply an uncomfortable place to be and work? This is why you don’t just select your office cubicles based on the nature of your work, but on the nature of your workspace as well. Often it can be difficult to visualize a three-dimensional space, especially one that’s supposed to be fully furnished to your specific needs. But with a professional space planner, one who has experience in working with office furniture and interior spaces, all circumstances are fully assessed to make the most efficient use of office space for you and staff. Cubicle World founder and President Jerry Mogyorody is a space planning expert, having run several businesses over many years that put him in the position of making every bit of office space count for his clients. Give us a call and we can discuss how Jerry can make your office cubicles harmonize with your office space. We offer our space planning services free of charge, including CAD drawings and quotes, and with no obligation on your part to purchase our office cubicles. 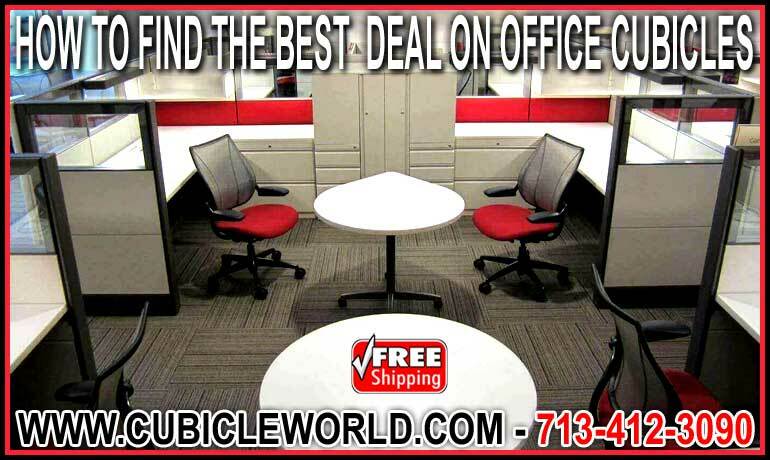 No money is spent until you actually purchase our cubicles! Finding the right materials for your office cubicle can mean opting for something low-cost but nonetheless high-quality. Whereas the look of real wood is timelessly beautiful, choosing a sturdy alternative like laminate for worksurfaces and other paneling gives you a lower price point while allowing for a plethora of colors and patterns that will work with almost any aesthetic. If your heart is set on natural wood, you can choose a type that’s less costly. Hardwoods such as maple, oak, and walnut, are popular choices in furniture, but they’re rare and therefore more expensive. Choosing a softwood like pine can be a way to reduce office cubicle cost while maintaining that warm feel of real wood. Fabric is a great choice for keeping your costs low in an office cubicle, while also providing a good level of noise-reduction for when extra sound privacy is needed. Glass is also a popular way to increase more natural and ambient lighting while still offering a level of privacy in dense office space. A combination of fabric and glass can break up the monotony of otherwise solid partitions while lending a contemporary look to your office cubicle. Many options are achievable while also offering ergonomic support to your body to minimize physical strains and maximize productivity and happiness. You can also look into our wide range of 8-hour ergonomic office chairs to complement your workstation. Make sure that you don’t go in for the glitz of extra features just for the sake of extra features. Some cubicles can offer seemingly convenient features like tack boards and paper management accessories like binder holders and paper trays. An increase in features in your office cubicle doesn’t always equal an increase in your cubicle’s usability. In fact, aside from adding unnecessary expense, you may find that they just crowd your space while hampering your workflow. The most important way to determine the best deal on an office cubicle starts first with the realization that you, your staff, and your business are the main drivers of your cubicle’s form. As long as you invest in materials that get the job done, give you plenty of room, are ergonomically supportive, and look good in the room, you will find that your money will be well-spent. No matter what form your office cubicle takes, Cubicle World can work with you every step of the way in making that form a reality. Along with Jerry’s vast experience, the considerable supply chain he’s built means that, no matter what you’re looking for in an office cubicle, we can always come in at or even under budget to give you exactly what you need. Don’t hesitate to call us today!